Power, a former journalist for U.S. News and World Report and the Economist and now the executive director of Harvard’s Carr Center for Human Rights, offers an uncompromising and disturbing examination of 20th-century acts of genocide and U.S. responses to them. In clean, unadorned prose, Power revisits the Turkish genocide directed at Armenians in 1915-1916, the Holocaust, Cambodia’s Khmer Rouge, Iraqi attacks on Kurdish populations, Rwanda, and Bosnian “ethnic cleansing,” and in doing so, argues that U.S. intervention has been shamefully inadequate. The emotional force of Power’s argument is carried by moving, sometimes almost unbearable stories of the victims and survivors of such brutality. Her analysis of U.S. politics what she casts as the State Department’s unwritten rule that nonaction is better than action with a PR backlash; the Pentagon’s unwillingness to see a moral imperative; an isolationist right; a suspicious left and a population unconcerned with distant nations aims to show how ingrained inertia is, even as she argues that the U.S. must reevaluate the principles it applies to foreign policy choices. In the face of firsthand accounts of genocide, invocations of geopolitical considerations and studied and repeated refusals to accept the reality of genocidal campaigns simply fail to convince, she insists. But Power also sees signs that the fight against genocide has made progress. Prominent among those who made a difference are Raphael Lemkin, a Polish Jew who invented the word genocide and who lobbied the U.N. to make genocide the subject of an international treaty, and Senator William Proxmire, who for 19 years spoke every day on the floor of the U.S. Senate to urge the U.S. to ratify the U.N. treaty inspired by Lemkin’s work. This is a well-researched and powerful study that is both a history and a call to action. Born in 1970, Power immigrated to the United States from Ireland at the age of nine. She is a graduate of Yale University and Harvard Law School. 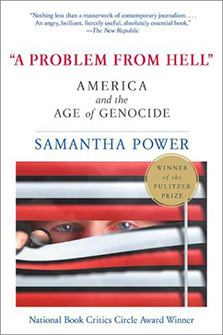 A Problem from Hell: America and the Age of Genocide received the 2003 Pulitzer Prize for General Non-Fiction, the National Book Critics Circle Award and the J. Anthony Lukas Book Prize.